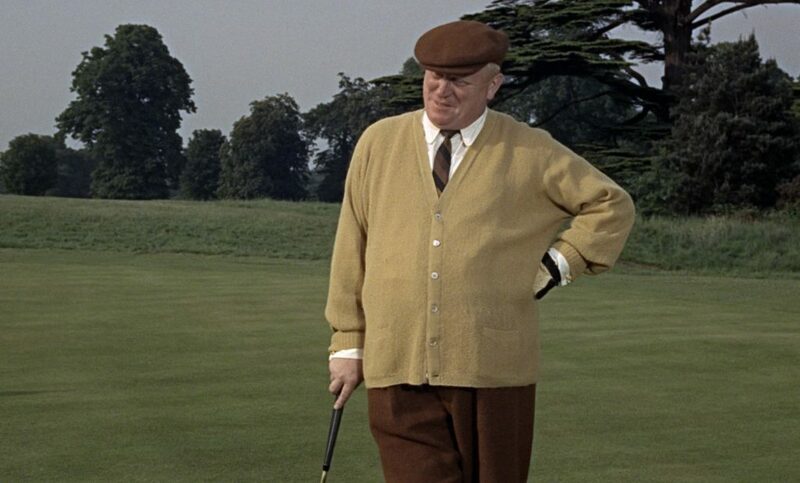 For golf with James Bond in Goldfinger, Auric Goldfinger wears a traditional English country sports outfit in colours that both flatter his warm autumn complexion and reflect his love for gold. 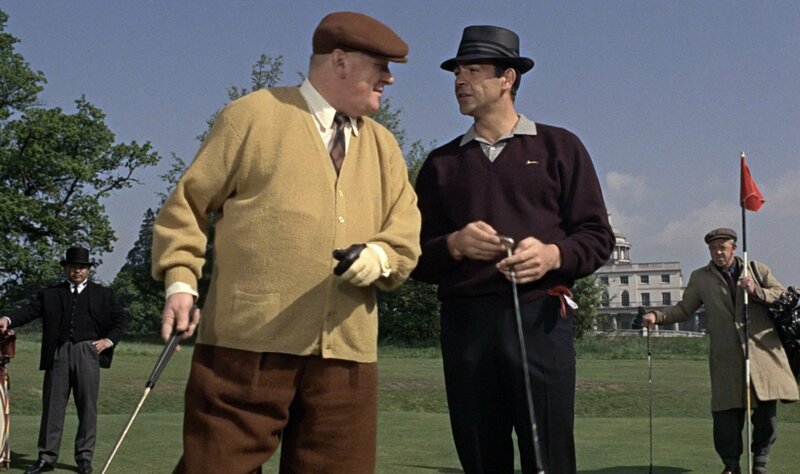 Compared to James Bond’s more modern polo and v-neck jumper golf outfit, Goldfinger looks very old-fashioned. His medium brown—rather like burnt umber—tweed three-piece sports suit unusually includes a jacket, plus-fours, and a flat cap. 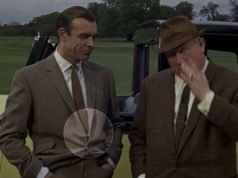 The suit jacket, which Goldfinger removes when golfing, has softly padded shoulders with natural sleeve heads and a draped chest, which attempts to gives Goldfinger the illusion of a waist. The jacket has one button on the front, which attempts to give him a more streamlined look. It is detailed with three buttons on the cuff, a single vent and open patch pockets for a sporty look. Instead of ordinary long trousers, this suit has a type of breeches called plus-fours. They are called plus-fours because they extend four inches below the knee. There are double forward pleats on either side at the top. At the bottom the breeches’ wide legs fasten around Goldfinger’s legs, and the fullness of the breeches’ legs blouses over. Plus-fours are a classic style of trousers for the golf course. 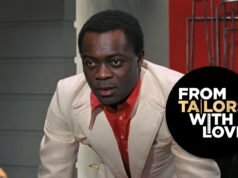 Under the suit jacket, Goldfinger wears a golden yellow cardigan in a very open, crunchy-looking knit wool. The cardigan fastens with six buttons and has small patch pockets. 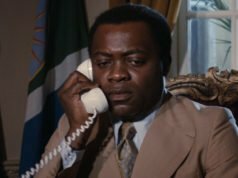 Under the cardigan, Goldfinger wears a cream shirt from Frank Foster with a short, rounded point collar and double cuffs. Though the collar is rounded, it’s not as round as a club collar. The tie has stripes in light and dark golds, and dark, medium and light browns. The tie connects all the parts of the outfit perfectly. Goldfinger’s shoes are chestnut brown bluchers, which are a single piece through the vamp and quarters with a heel counter and tabs sewn to the front for the four-eyelet lacing. With plus-fours, Goldfinger’s plain beige wool socks are on display. On his left hand, Goldfinger wears a golf glove in yellow and brown. But Goldfinger had made an attempt to look smart at golf and that is the only way of dressing that is incongruous on a links. Everything matched in a blaze of rust-coloured tweed from the buttoned ‘golfer’s cap’ centred on the huge, flaming red hair, to the brilliantly polished, almost orange shoes. The plus-four suit was too well cut and the plus-fours themselves had been pressed down the sides. The stockings were of a matching heather mixture and had green garter tabs. 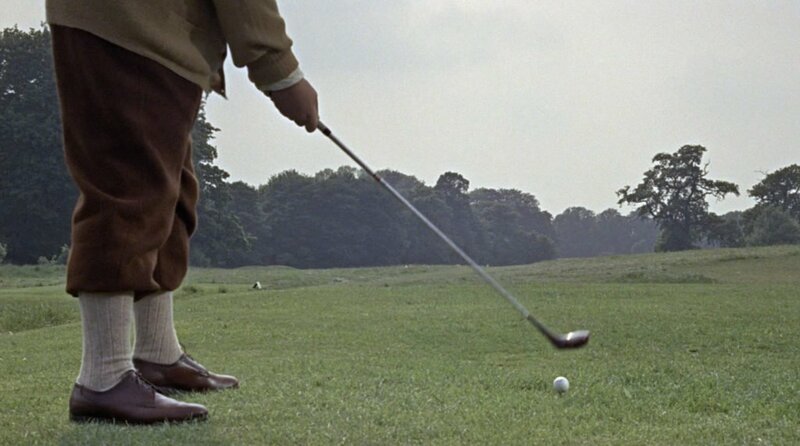 It was as if Goldfinger had gone to his tailor and said, ‘Dress me for golf – you know, like they wear in Scotland.’ Social errors made no impression on Bond, and for the matter of that he rarely noticed them. With Goldfinger it was different. Everything about the man had grated on Bond’s teeth from the first moment he had seen him. The assertive blatancy of his clothes was just part of the malevolent animal magnetism that had affected Bond from the beginning. Probably the most accurate interpretation of clothing from the books. ‘Dress me for golf’ indeed. Just reading Goldfinger at the moment! Great timing and excellent post as usual Matt. Sam, this is not filler. This is what makes this blog so awesome. Like Miles I’m also re-reading Goldfinger in preparation for Trigger Mortis and found this post very entertaining. Also, you know, this is The Suits of James Bond, not suits from spy movies. Anything from a Bond film should really take precedence over anything else. Agreed with the last two comments. Even if the clothing is worn by characters that aren’t Bond, content from the Bond movies should take priority. Thanks for the mention, Matt. I also agree to the statements above (we already had this discussion on the occasion of dealing with Goldfinger’s silk dinner jacket). “Blatancy” is what today one would call “bling-bling” but I am not sure if it would really be considered as “social error”. The dress code of today isn’t as strict as it was at times when Fleming wrote “Goldfinger”. Sometimes I wish it were because often there are excesses of “bling-bling” – people who are really possessed of showing off their clothes at any price. 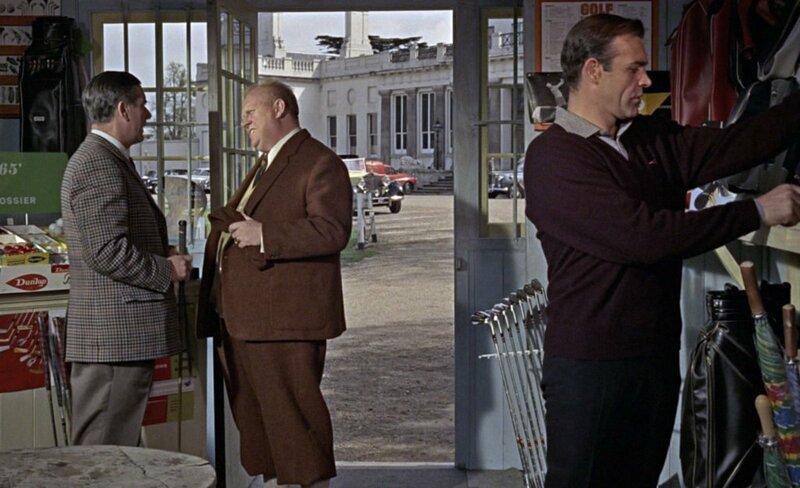 From today’s perspective Goldfinger’s golfing outfit isn’t as conspicuous as it might have been then. The only thing which is a bit striking are those big fat gold cufflinks he’s wearing. I’ve read Frobe’s autobiography and he mentions them there (he was happy to be allowed to keep them as a souvenir). According to Mo0re’s “Bond On Bond” the literary Goldfinger was named after Erno Goldfinger, a prominent architect of that era. Evidently he was not amused at all by Fleming naming a villain after him and created many legal problems for Fleming and the publishers! I think they got his attire just right for the both the book and the film. A hacker who habitually cheats would be very concerned with presenting himself as a golf traditionalist. It’s very likely that Fleming, a golf tragic, encountered men of this sort on the links. The expression on Goldfinger’s face when Bond throws down the gold bar is amazing. His pants-socks-shoes ensemble suspiciously reminds me of Tintin. The whole suit for that matter. Even the socks would be changed by Hergé in his mid to later works to white to create the classic Tintin look.